I’ve taken a month hiatus from blogging for the first time in years, and I’m ready to get back into the swing of things with some healthy, simple, and delicious dairy-free recipes. The month long break wasn’t intentional; December came at me like a charging bull, and it was keep up or get trampled. I think I might have gotten stepped on a few times. During November, I finally finished the first part of one of the biggest goals of my life: to write a novel. I did it with the encouragement and motivation of NaNoWriMo, and I successfully completed 50,000 more words, adding to my start of 26,000. I now have a full-length fiction novel under my belt, with a great plot, ending, fully developed characters and everything. After that, the onslaught of everything else in my life I postponed came at me, plus a series of other things. I put the novel on hold for a bit so I could catch my breath. I intend to start the rewrite now that I can breathe, but the whole catching my breath part lasted much longer than I expected. The holidays are always busy, but the biggest time consumer this month was our move to a new apartment and the horrible cold I caught that resulted…from the stress of moving…before a strict time deadline…on the coldest day of the year. On top of all that, I had to unpack and set up the whole apartment–you can guess how long that took! I just remember the painful task of searching in box after box for tea, honey, and a mug. My husband was amazing and took care of me so nicely, bringing me medicine, orange juice, and flowers. Thankfully, he didn’t even get sick. Now I finally have my new kitchen set up the way I want it, my refrigerator full, and I’ve even started cooking. I got some awesome new photography equipment for Christmas, so as soon as I learn how to use it properly, my pictures will get better and better! For this particular recipe, I used my brand new tripod, reflector, and remote for the first time. I’m starting this year off with one of my favorite salad combinations. I’ve never posted a salad before, but I’m trying to stay healthy by eating fresh, raw, colorful veggies. Soup and salad is the way to go right now. 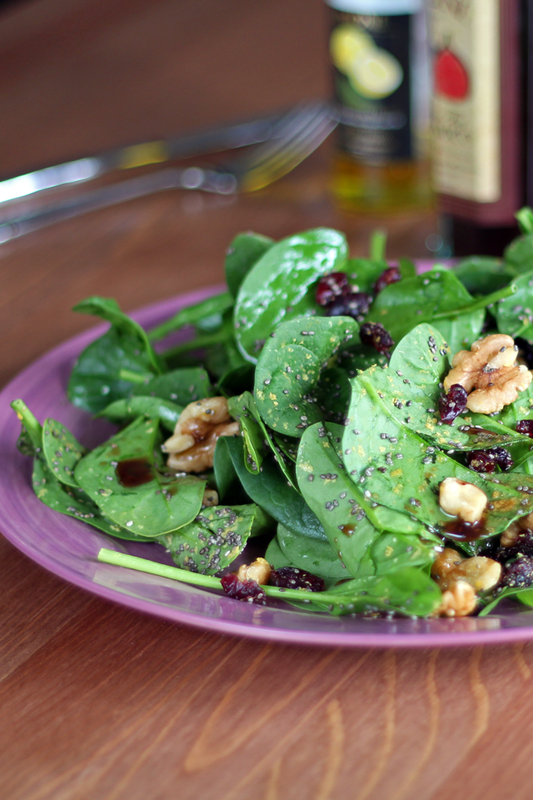 This simple spinach salad is packed full of omega 3s and antioxidants. 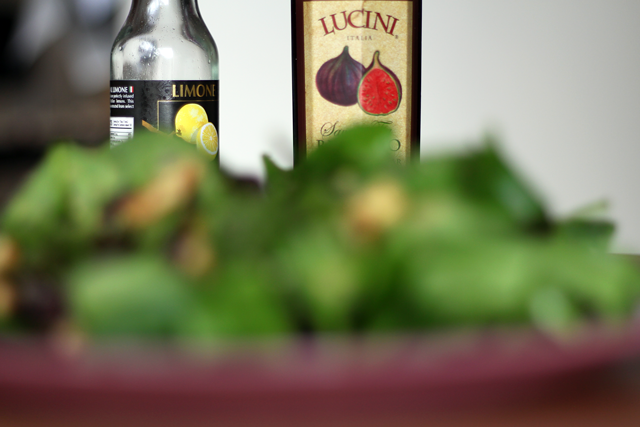 There’s nothing quite better than the light tasting yet flavorful combination of lemon olive oil with fruit-infused balsamic vinegar. I used fig-infused balsamic to be exact. Store-bought salad dressings are a thing of the past for me! This salad has no added salt and makes you wonder how you could ever have eaten that iceberg lettuce and cheese combination with ranch. Would you like some lettuce with your fat? Just kidding, if I could eat dairy I totally would. 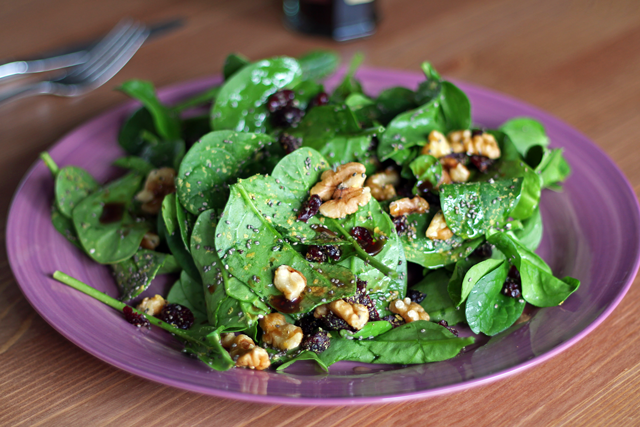 But this spinach salad is seriously delicious. It’s crisp, refreshing, and super healthy. Pair with a steaming bowl of soup. 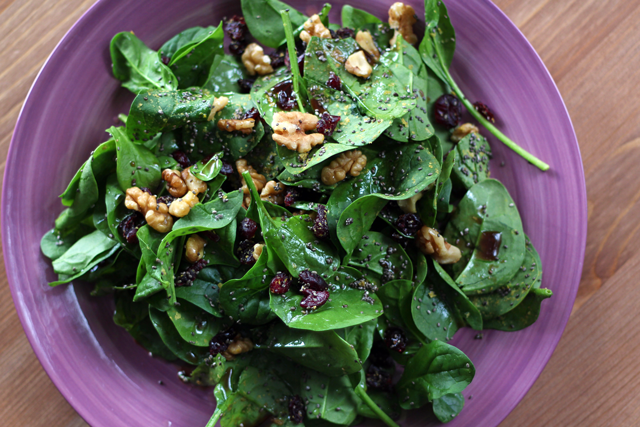 In a medium size bowl with a lid, add spinach, walnuts, cranberries, chia seeds, pepper, and nutritional yeast. Close the lid tightly and shake until the ingredients are mixed. Transfer onto a large salad plate and drizzle on lemon olive oil and balsamic vinegar. Add more to taste, along with salt and pepper if you desire. Don't you feel so healthy?